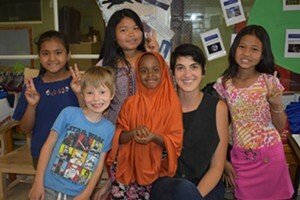 Habitat: Diminutive Dwelling | Habitat | Kids VT - small people, big ideas! Sally Anstey and Rob Alcusky's quirky, magical treehouse — poised between two hemlocks and a maple — is clearly not a rushed weekend project. Long envisioned by Sally as a "little private retreat" in their Hardwick village home's backyard, the project has been nearly 20 years in the making. 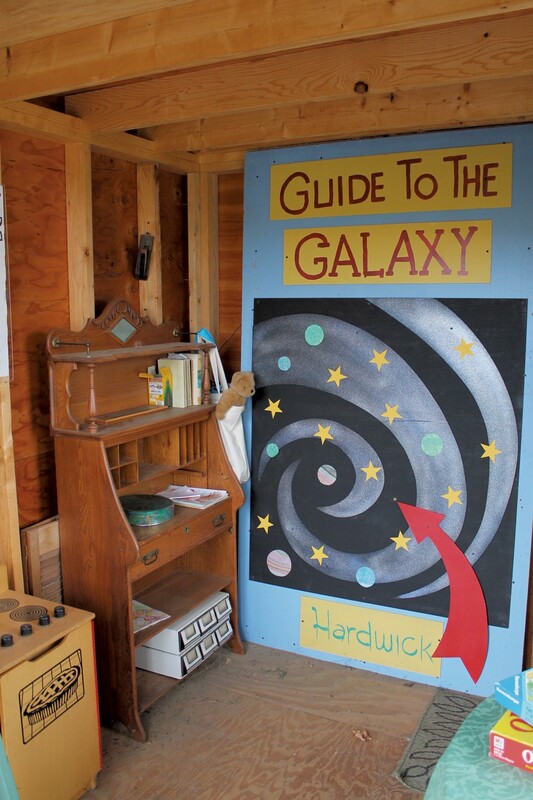 When their granddaughter was born six years ago, the small space evolved into a children's hideaway. Built on a steep hillside, the treehouse rests partly on granite. Rob, a woodworker by trade, anchored the suspended end between trees, with one hemlock surrounded by a deck. 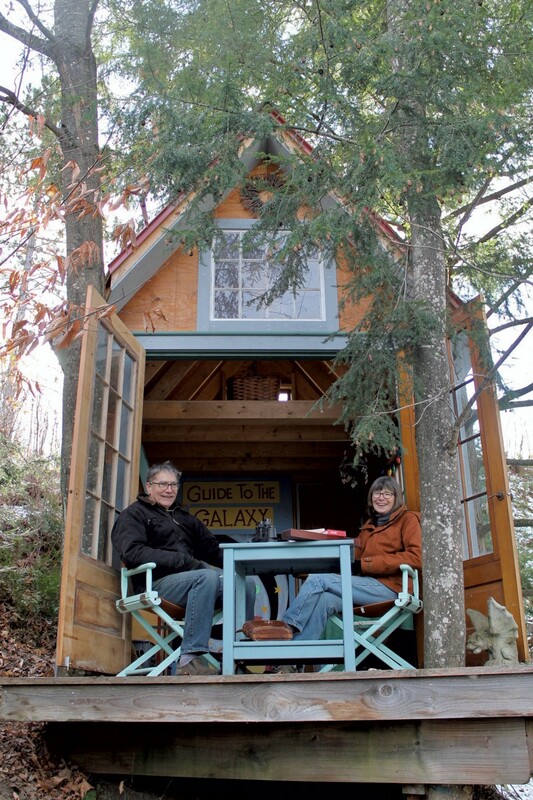 Sally hired a carpenter to frame the almost 100-square-foot building. The couple did the rest of the work and "had a lot of luck" sourcing salvaged materials, Sally said. A sleeping loft — accessible by a homemade ladder — spans one end of the light-filled space. A child-sized kitchen is tucked under it. French doors swing open to the deck, surrounded by green-needled branches, creating a Swiss Family Robinson vibe. 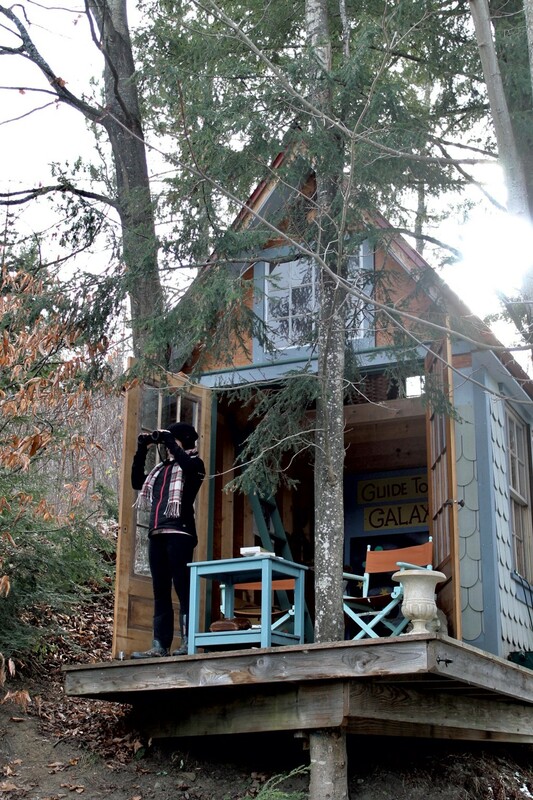 With satisfaction, Sally described the day when the treehouse was officially gifted to their granddaughter, Hazel, who was around 4 at the time. "We told her this space was hers, and she could do what she wanted. How often does that happen to a child?" The little girl "embraced" the space, Sally said, and directed furniture placement with her small hands on her hips. When Hazel isn't visiting from her home in Massachusetts, Rob and Sally enjoy unwinding from work there and swapping their days' stories. 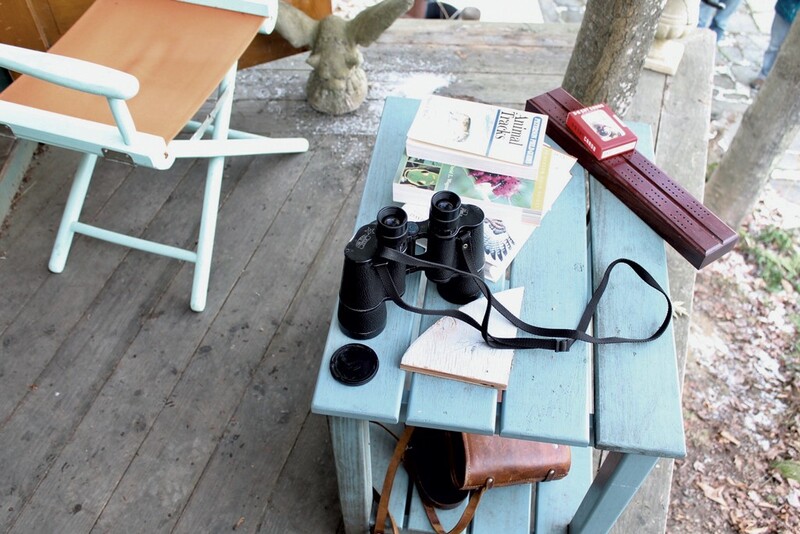 The haven is just a few steps from their home but captures the faraway feel Sally desired. The structure isn't done yet, Sally insisted, describing the patterned linoleum she imagines covering the plywood floor. Perhaps what's most charming about this little dwelling in the trees is its organic evolution — sprouting from the shared vision of two loving grandparents, nourished by fortunate finds and enjoyed by multiple generations. "Habitat" celebrates places where Vermont families live and play. Got a sweet space you'd like us to see? Email us at ideas@kidsvt.com. Some of the wood, including the pressure-treated foundation joists, was salvaged from local sources. The French doors and back door, which was added as an easier entry point for less agile adults, came from a garage sale. Nailed beside the back door is a hand grip purchased from local blacksmith Lucian Avery. Leftover red tin from Rob's shop provided roofing. Sally gleaned the windows from a discard pile she spied on her morning commute. Cherry wood posts lining the path to the treehouse were snapped up at a local yard sale. 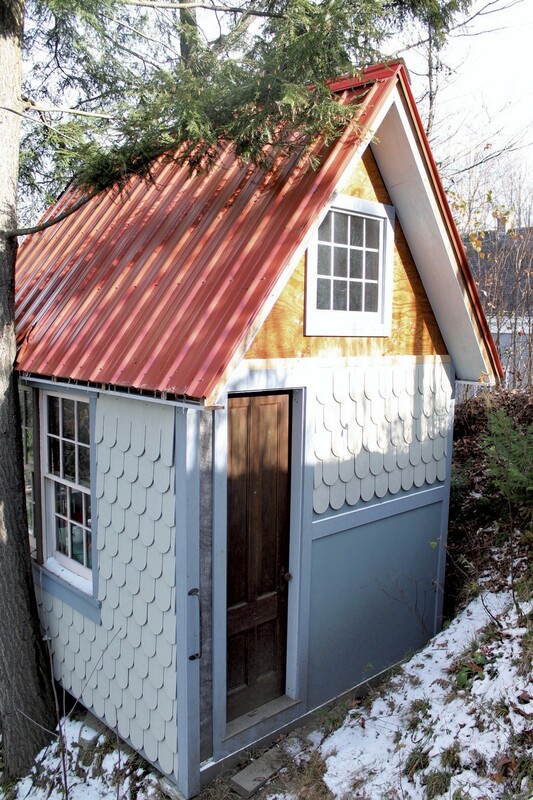 The fish-scale cement siding, purchased new, was a splurge. Yet to be nailed down: hand-carved crown molding — from friends who bought an East Hardwick house and discovered the treasure beneath their chicken coop.